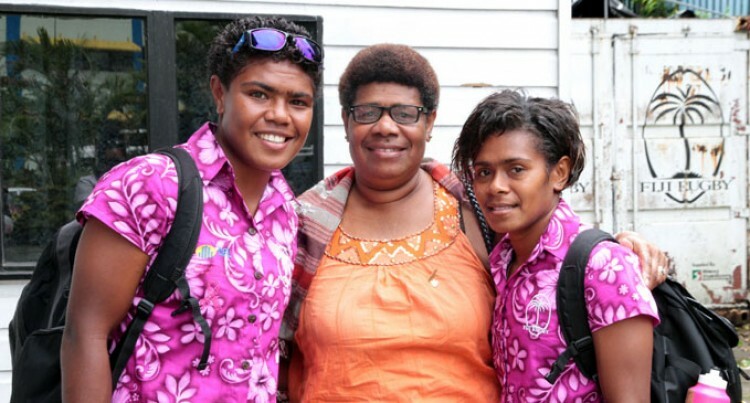 Makarita Roqica (middle) with her daughters Rusila Nagasau (left) and Ana Roqica (right) at the Fiji Rugby Union yesterday. Makarita Roqica will be cheering on her two daughters in the Telecom Fijiana team during the Oceania 7s Olympic qualifying tournament in Auckland this weekend. Aiming to book a spot in the 2016 Rio Olympics in Brazil, Roqica’s daughters Ana Roqica and Rusila Nagasau will help the Fijiana team make that dream a reality. Fareweling her daughters in Suva as they left for the Uprising Beach Resort yesterday, Makarita said she has never stopped being proud of her two girls. “I feel so happy that I have two of my daughters representing Fiji and also playing rugby, I am so very proud of my girls,” she said. “I never thought that my daughters would be playing rugby at this level and to be together making the country and their family proud. “The power of prayer is something I have always stressed every time they leave for overseas tour. “I always tell them to put God first and everything falls into place. “Not only that, but I always tell them to respect their teammates and play as a team. It is not easy going overseas without any family and the only family you have is your team. I remind to love and treat them well and with respect. “When you have a good relationship with your teammates, you will play and do well..
With the full support of the family, Makarita is confident the team can qualify for the Rio Olympics next year. The Telecom Fijiana team departs tomorrow for New Zealand. They play Cook Islands at 12.58pm (Fiji time), Tonga at 3.34pm and Samoa at 6.10pm on Saturday. On Sunday they play PNG at 10.22am before the Cup quarterfinals start.